BT, CTLM, IKAN, NTT, PMCS, VZ. 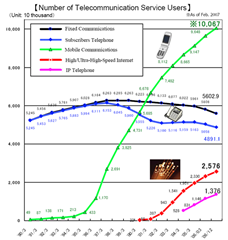 The Japanese Ministry of Internal Affairs and Communications is a great source for data on Japanese communication infrastructure and usage. A recent document provides a state-of-the-network update and lays out the goals for the next 3 years. By the end of 2010, Japan expects to achieve 100% Broadband coverage, 90% of which will be ultra-high speed. The country currently has 95% coverage with 80% ultra high speed. 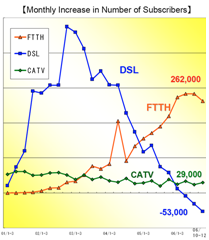 The chart to the right illustrates the shift to high speed broadband through aggressive deployment of FTTH. The resulting plunge in DSL deployment has crimped the revenue for companies such as Centillium (CTLM) and Ikanos (IKAN) as NTT (NTT) goes whole hog with GE-PON. Incredibly, DSL is now seeing net disconnects as households move to fiber, the only nation in the world where this is happening. Verizon’s (VZ) served area is moving towards this situation and should see net DSL disconnects within the next few years. Ikanos does still recognize some revenue from FTTH installs as approximately 1/2 of them use VDSL for the last 100m. I’ve heard conflicting stories that NTT may/may not eliminate VDSL in future installations. My gut feeling is they will not, and that VDSL will play a major role in deployments, particularly in Asia. PMC-Sierra (PMCS) continues to be the prime silicon beneficiary of the GE-PON deployment in Japan. From a more broad perspective, Japan provides insight into the evolution of overall communication trends in an advanced technological society. What is most interesting is that fixed lines are not being eliminated – from a macro perspective they are replaced by IP telephony. 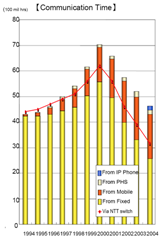 While this is bad for providers that rely on fixed lines for revenue it is indicative that the concept of a ‘landline’ is not going away, just evolving technologically. This is good news for other big PTT’s and RBOCs provided they have programs in place to cannibalize their POTS lines. Underlying the shift in connectivity technology is a shift in user behavior. Despite having nearly instant access to voice communication via mobiles, Japanese are steadily cutting back on voice calls. One can speculate on what is filling the gap (email/SMS) but it is rare event indeed when technology reverses a well worn trend. The article outlines high level plans for the Japanese Next Generation Network (NGN) spearheaded, of course, by NTT. NTT is known as a technology trailblazer and was the first carrier to drive widespread adoption of FTTH and 3G cellular. They also championed stillborn technologies such as PHS and ISDN – but being an early adopter has it’s downsides. Their outlook for what the network of the future is notable in that appears to heavily rely on IP Multimedia Subsystem (IMS). IMS stands to be one of two things – Telco’s last White Elephant project prior to being forced into commodity providers of connections, or a mechanism that transitions their incumbency to the next stage of the networks evolution. NTT, as well as British Telecom’s (BT) 21CN project will be the first real world bellwethers for the commercial viability of IMS. It is a process well worth watching. NTT at the moment installs all fibre connections for apartment blocks (high rises are common there) with an FTTB architecture, where VDSL is used in the vertical segment (from the basement to the apartment). In number of connections it seemed to be that it was more (even much more) than 1/2 at the moment, because the price is different than for “pure” FTTH and is lower than a DSL connection. It is well known that Metalink, Nasdaq MTLK provides NTT with the VDSL for its GPON installs and has ben doing so since 2005. For those install where MDU’s may have copper in place. THat is until NTT developed its bendable Fiber cabling. Yes but here is the critical question and since you seem well informed- what is Metalinks market share vs. Ikanos? Based on what metrics? will see diminishing returns in the future. So many manufacturers have exited the VDSL2 market as the rewards are NOT there. With carriers depl;oying fiber to the basement and most MDU’s now requirig the Fiber be run all the way through the MDU not just to the basement. It future proofs the need for upgrades if you stick with the copper network. Verizon has demonstrated its position by dismantling the copper in ALL the MDU’s in which it is repositioning with fiber. France telecom and Italia telecom follow the same policy. Their networks are Fiber up to the homeowners CPE. Good Luck with your speculation about Ikanos. I am surprised you are not aware of the fact MTLK is no longer a player in the VDSL2 market, due to standartization issues. Metalink has never been successful in penetrating the japanese market with their new VDSL chips and have totally shifted their focus to 802.11n. Ohad – this is what I knew and suspected but I have learned one can be wrong from time to time. Given IKAN does more VDSL revenue in a week than MTLK does in a quarter the above comment made no sense. MTLK is in SHDSL stuff as well that should be interesting going forward. * I miss the old Yahoo BB quarterly reports when they were part of Softbank. Their vision over the past 8 years has been incredible. They were also very scary ’cause they were so aggressive on spending. They did things like selling modems in street kiosks, too. They really kicked the old guard in the privates. * The one thing that I’ve been really impressed on the JP front is not the speed and pricing of BB. It has been their development of Internet Applications. JP was first with big Voip usage (Yahoo BB charged for a year and had something like 90% adoption and later just rolled it into their std offfering), Internet TV ( ~ 5 years ago), all the gaming stuff. ie. They’ve been making high-speed BB desirable to users bigtime. Verizon is spinning off Maine, New Hampshire and Vermont because it believes that it would be impractical to install fiber in these rural areas. Fairpoint Communications is promising DSL to customers in these states. Looking at you gragh and judging by your estimates of 80% of Japan having ultra high speed broadband, these states will be behind Japan in high speed communication. Largely populated areas like Massachusetts and Rhode Island will be far ahead. In your opinion, what does this mean for the future economical conditions in regions the don’t have fiber? It means they either do it themselves or do without. I don’t understand why it is everyones problem rural areas don’t have fiber. It’s their problem. No one complains about rural areas not having a world class symphony. The fact is that cities have enormous logistical advantages. That is why people live there. Want the BSO? Move to Boston. Want fiber? Move to Boston. I grew up on a farm. We had 2 TV channels. I live in the city now. If someone doesn’t like the situation, they need to take control of it themselves and fix it. It is great to see Vermont doing just that with recent legislation. I grew up in the city and we only had 5 channels and for most of my young life only black and white TV. I dreamt about living on a farm and have never seen the BSO. However comparing these to high speed internet access is comparing apples to oranges. Moving is not always a option. This deal, like most, involves the bottom line. The consumer will not win if the FCC and PUC and PSB(in Vermont) let this deal go through. At the very least they’ll never have (or at least in the forseable future) high speed internet access. If the opponents are correct and Fairpoint goes belly up, rate payers will suffer even more. Burlinton Vt. is a beautiful, vibrant city. It is not a campground. It like many other cities in New Enlgand need high speed internet for economic development. Multi-billion dollar public corporations like Verizon should not be allowed to spin off customers for the sake of a tax break. My home just outside of Boston has Verizon FIOS. I think that should be a choice for all Verizon customers. * there is/was no way this could be true because access to “speed” means that you need to be close to high speed PoP’s. * suffice it to say … people always want something for free. * that said — It is interesting that “remote” in Internet-Land translates state/regional remoteness. The backwoods in Internet-Land lives in some interesting places. * will this result in a “new world order?” who knows … but there sure seems to be big debates about it. There are certainly some who would find the internet boring. There are others who have a phobia of it. But in the future the vast majority of people will have access to it…and it will force changes in lifestyles. I went into my bank the other day. The lobby had been done over. I never saw a construction tool. I realized that it had been a while since I actually had been to the bank. I took a class, actually 3 classes in Excel, with a teacher in North Carolina, and students from all over the country. My point is these services came to me. I did not go to them. …is a company that maintains the infrastructure for a public service (often also providing a service using that infrastructure). Public utilities often involve natural monopolies, and…if privately owned, the sectors are specially regulated by a Public Utilities Commission. It’s a shame that Verizon accountants decided that the shareholders would be better off with a tax cut now than providing high speed internet access to paying customers in rural locations (who in some cases have put up with sub-standard service for years). However if anyone on the PUC or PSB or FCC is paying attention at all they will hold Verizon feet to the fire on this one. The rural vs. urban conundrum is here to stay. Sure, it’s a shame. But you can’t expect commercial ventures to go where it’s not profitable “for the good of the people”. That’s what governments are for. Nice post, Andrew, by the way. I won’t bother with analysied this data on http://www.fiberevolution.com, I’ll just point to you! Can anyone explain a beginner like me why telcos would deploy, as part of their FTTH roll-out, copper inside buildings rather than fiber? When copper already exists and can be re-used, I understand, but otherwise I don’t. Is the fact that fiber is not enough bendable the reason? Thanks to anyone who can answer my naive question. It is confusing. The idea is that the most expensive fiber to install is the last 1000m or even 100m. Instead of doing this, the existing copper is re-used for this segment. No new copper is put into the building. This makes the most sense in apartment buildings or ‘MDU’s – multiple dwelling units. It is a trade off. You eliminate installation costs but now have active electronics widely distributed in the network. One of the advantages of fiber is that it is relatively distance indifferent. GPON for example, is designed for a distance of 20 km. The majority of the cost of deployment is spent on civil engineering and not on the fiber. So, deploying GPON in a rural environment using areal cables should not be more expensive than deploying in urban areas which require using buried plant at a very high cost. Am I missing something or is there another reason for not deploying fiber in rural areas? I’ve heard both sides of the table for rural environments. For: Opex in rural environment is high for equipment in the field. Eliminating remote terminals is a big advantage. Rights of way are more accessible, and homeowners may be willing to foot some of the bill. Against: Low density means much of the fiber is a home run, not shared. THerefore while costs/meter installed are lower, the number of meters installed per home is much higher. So cost per home ends up being more than an urban environment. Obviously, which story you get depends on what the particular person is selling. This website and the materials and information on this website are provided by Nyquist Capital LLC and may be used for informational purposes only--not for any investment purposes. Nyquist Capital LLC and/or any affiliated entities may be involved in trading or dealing as principal in securities (or in options or other derivatives based thereon) of companies mentioned here or referred to in the materials and information made available here from time to time. In addition, Nyquist Capital LLC or its affiliates, members, shareholders, directors, officers and/or employees, may from time to time have long or short positions in any such securities or in options, futures, or other derivative instruments based thereon. By using this website, you represent that you have read and understand our terms, conditions and policies and you agree to be bound by these terms and conditions.